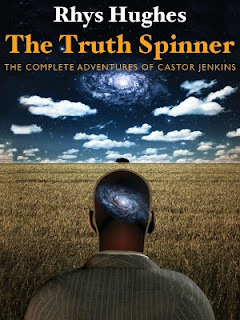 Castor Jenkins seems to love the sport of telling the strangest and most ridiculous tales in such a way as to be so round-about and confusing that listeners hardly dare arguing the validity of his claims. The stories are usually hilarious; just the thought that he expects his friends to believe such things is riotously funny. In the end, though, poor Paddy and Harris are usually so dumbfounded and confused that they forget the money Castor owed them, or end up buying him drinks, showing that Castor truly missed his calling when he opted not to go into politics. Never have I read a character who would have done so well in the real-world realm of politics or political speech-writing. The Truth Spinner is separated into three parts. ‘The Munchhausen of Porthcawl’ begins the book, with a humorous round-about entry on the truths we put into and take from fiction. This is noteworthy for the truth it, itself holds, and it sets the tone for the rest of the book well. Hughes’ style of writing is wonderful and expertly executed, putting me in mind of Arthur Conan Doyle’s more humorous bits more often than not. Most of the stories contain loads of silly word-play, poking fun at verbosity by being verbose, itself. It’s a rare talent that could tie such things together so well, leaving readers shaking their heads and grinning, not quite sure what just happened, but positive that it was a good thing. ‘All in a Flap’ is a story about birds and the descendants of Brazilian refugees who have lived their entire lives on a ship lost at sea for over a hundred years. Castor finds himself telling the refugees that they cannot just land wherever they please and claim the land for their own country, because the lands are already governed, complete with armies. Castor is dumbfounded that the refugees don’t understand this, but in reality, this is nothing new. People have been traveling to places new to them and claiming the lands as their own for time immemorial. Hughes does a wonderful job of showing just how ridiculously unfair and elitist these actions are. Possibly the most overtly socio-politically relevant story in The Truth Spinner is also one of the shortest. ‘Penal Colony’ needs only two pages to show us that you don’t need to pull the trigger to condemn a man to death, you only have to do nothing to protect him from it. When people are considered extremely dangerous because they’ve murdered people or committed some other heinous act, many societies condemn such people to death. Once upon a time, they were dropped off on a large, remote island … you know, Australia? Whether condemned by firing squad, lethal injection, hanging, or being marooned in a hostile environment where death is as likely as not, someone has to be responsible for putting the criminals in this place or situation. ‘Penal Colony’ asks, then, what is it that separates the condemned from the condemners? The Truth Spinner is fun, humorous, whimsical, and poignant. I would recommend it to mature readers who enjoy finding truths buried in entertainment. Fans of Arthur Conan Doyle will almost certainly love it. Hughes shows how characters—Castor in particular—can influence a story, and that it is they who really bring the stories to life.